Maybe the single-digit temperature had me thinking about Florida; it was 2˚F outside the morning I wrote this. You denizens of the upper Midwest may think that’s nothing unusual, but it was darn cold for suburban Philadelphia. While the anticipation of some warm weather is welcome during any Pennsylvania winter, it’s actually HIMSS 2014 that really has me thinking about Florida. The meeting will take over Orlando’s Orange County Convention Center later this month, and information management is an ever-growing component of medical imaging and all of health care. When I arrived at Radiology Today in 2003, HIMSS was a meeting attended by our sister publication For The Record, which focuses on medical records. Film was still common in radiography, and PACS typically didn’t venture outside of the radiology department. The Society for Imaging Informatics in Medicine (SIIM) was still the Society for Computer Applications in Radiology (SCAR), and enterprise imaging mostly happened on Star Trek reruns. Two five-year missions later, sharing images across the health care enterprise and incorporating them into EMRs have become two key imaging IT objectives. The separation between medical images and medical records is diminishing: The twain have met. The PACS administrators and radiologists who attended SCAR largely have been replaced by hospital IT staff tasked with fulfilling their organizations’ enterprise IT objectives. The EMR is the star of HIMSS, but radiology has a huge interest in how its images and data will merge into electronic records as well as how that integration may provide more information to help radiologists interpret those images. In one sense, the changing IT environment illustrates the benefits that all of health care may be able to obtain with more integrated care. 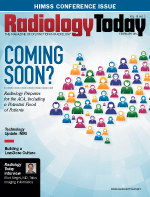 Of course, we’re not there yet, but it’s a target that radiology organizations and hospitals should be aiming to hit. That’s why I’ll be at HIMSS later this month, and it’s also why this issue includes an interview with Eliot Siegel, MD, a professor and the vice chair of research informatics at the University of Maryland School of Medicine’s diagnostic radiology department as well as the chief of radiology and nuclear medicine at the VA Maryland Health Care System. He’s a well-respected voice on imaging informatics, and his thoughts definitely are worth considering.